Today is International Women’s Day, when the world joins together in celebrating the political, economic, social and cultural achievements of women while recognising that more needs to be done to put them on an equal footing. In that vein, the theme this year is Press For Progress, calling for an acceleration in the mission to achieve gender parity, in our lifetimes. We are proud to say that women lead the way at Topaz, and we are proud of the differences this makes in their lives as they strive to build their careers, define their own independence and pave the path for their daughters. So much of our strength, resilience, flexibility and progressiveness comes directly from the roles that the women of Thalias have played in making it the company that it is today. One who has been with the restaurant for almost all of its existence is Prak Yeng, our Chef de Partie. 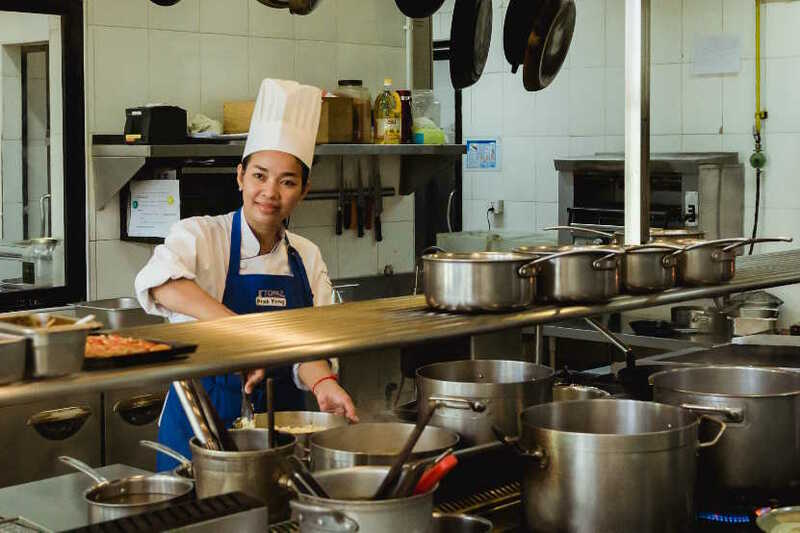 She joined Topaz 16 years ago as a member of the service team, but her desire to lead a more independent life soon led her to training in the kitchen. “Also, I love cooking”, she said with a smile when we were able to persuade her to sit down for a minute last week. Since then, her life has transformed. She has built a career that has followed a clear path and allowed her to grow, leading to a better standard of living and a lot more confidence. She feels she has much more control over her life than her mother, a housewife in Kampong Chhnang with few choices, did. “I moved to Phnom Penh from the province, got a good job and can take care of myself and my children”, she says. “I’m independent and can do more and be more than she was able to”. And just as importantly, she’s building an even better future for her two daughters. Aged 6 and 13, Yeng’s daughters are already studying hard. “I’m doing my best to provide them with a good education so they can go to university”, says Yang. She hopes that her eldest will become a teacher and her youngest a doctor. “I hope they will go even further than me”. And she supports them all the way with a message that she has for all women in the world: “Encourage yourself to be better all the time, and don’t be afraid to fail if you do something”, says Yang. “You should always keep hope within you”.